She was so excited. She spent a full hour in the bathroom for her hair and make-up. She asked me to iron her dress and if she could borrow one of my necklaces for the special occasion. Her energy was buzzing. My preparation, on the other hand, was in full procrastination mode. I slogged around the house – near dreading the finality this night would bring. At the end of the night, my eldest daughter would officially be a high school student after having graduated from middle school. I didn’t feel ready for this. 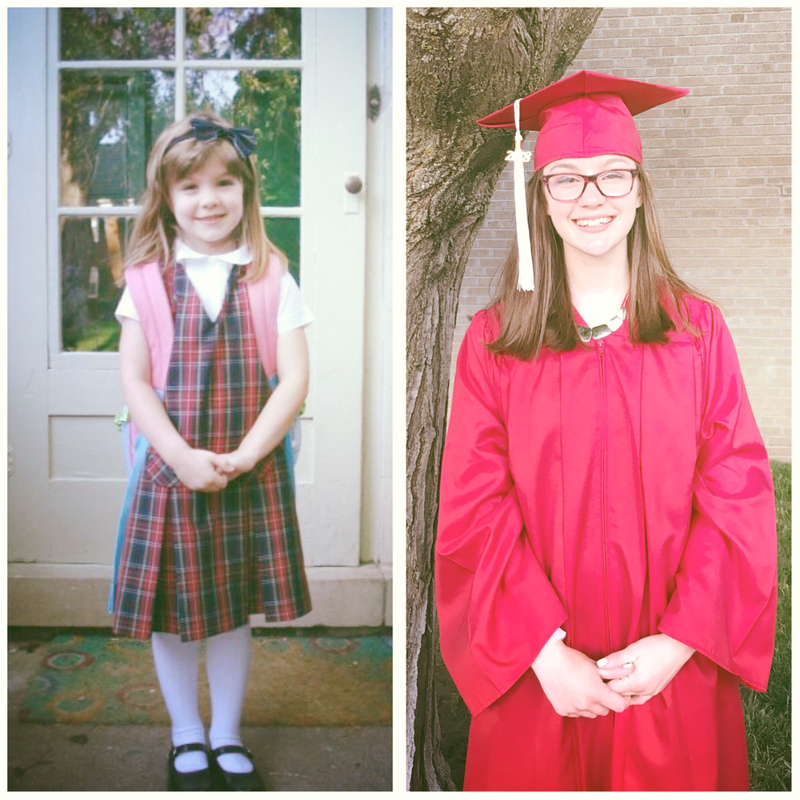 My daughter, Anna, attended her grade school from kindergarten through 8th grade. There were approximately 21 kids in her class. I know them all and watched them grow up over the last 9 years. Now, I was watching them walk in a processional toward the front of the cathedral in their graduation gowns. I wiped a tear as Anna passed our pew. She looked at me with her bright and beautiful smile. Preschool, middle school, high school, college and beyond, graduations serve to earmark the path of growth and development. These ceremonies remind us of our past, present and future. We reflect on our accomplishments and failures leading to this moment. Excitement grows as the new, unknown is about to unfold before us. Just the evening prior, I was conducting another graduation. At our Next empowerment series, I bestowed roses and hugs on the women who had been on a path of self-discovery since January. One of the themes of the night was “Everything will be okay in the end. If it is not okay, it is not the end.” We did an exercise in visioning and encouraged each other to take the long view. I tried taking the long view now as I watched Anna shake hands with the principal who was handing her a diploma. I didn’t really want to. I just saw her getting older, more independent, and moving away. The predicament of parenthood stared me in the face – wanting them to simultaneously grow and stay young. As with most major life changes, the first look may be fear filled. It may be overwhelming, sad, and unnerving. But I knew from experience to keep looking. I reflected on the 9 years that seemed now to have gone by in the blink of an eye. In that time she had experienced our family divorce, and still she thrived. I looked back at all the worry I had clung to – all those little details that had felt worth fighting for with her dad. Now in taking the long view, I could see that it now seemed somewhat trivial. I had arrived at the end of the divorce worries about ruining my daughter’s childhood as I saw her now transitioning faster still toward adulthood. My daughter had reached this milestone successfully. She is happy, well-adjusted, and a daughter that makes both her parents proud. Not only did she reach this milestone, but I too was graduating from being an elementary school mom into the final phase of parenting a school-aged child into adulthood. I could transition away from old worries and stories about the impact of divorce. Her graduation gave me the gift of seeing that everything was okay.